When we say "we tow it all", we tow it all. We offer towing services for various vehicles such as tractors. We'll tow your tractor to and from your farm or where ever you need to bring it. Need to take your tractor to be serviced? You can't legally drive your tractor on main roadways to get to a service shop. Call us and we can definitely be at your service to take your tractor where you need it to be. 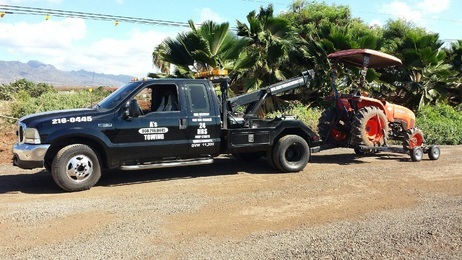 Call us anytime at (808) 425-9250 for your tractor towing needs.